November launches us into the holiday season and Virginia’s Blue Ridge is a prime destination to soak in the festivities and flavors. From elaborately decorated trees to performance traditions like “The Nutcracker,” you will be treated to an unforgettable season. Join us to get into the spirit. We have five reasons you should book a holiday getaway to Virginia’s Blue Ridge. All around Virginia’s Blue Ridge there are communities hosting annual tree lighting celebrations. Find a perfect cup of hot chocolate and join in the merriment of carols and illumination. Be inspired by the incredible tree display at The Hotel Roanoke & Conference Center, Curio – A Collection by Hilton during Fashions for Evergreens. An annual event, Fashions for Evergreens is a fundraiser for the United Way of the Roanoke Valley and features more than 35 professionally decorated evergreens. You’re invited to vote monetarily for your favorite, and that “vote” will be a direct contribution to United Way. It’s a fun way to get excited about the holidays and do good for others, too. Fashions for Evergreens is Thanksgiving Day to New Year’s Day. If lights and glamorous trees don’t set your heart on fire for the holidays, the events and festivals of Virginia’s Blue Ridge are sure to spark a flame. Tour Old Southwest, one of Virginia’s largest historic districts, for the Old Southwest Parlor Tour of Homes. Indeed, this is an annual opportunity to tour historic homes decorated for the season. Plan your visit for December 2 or 3 to join the tour. The Roanoke Times Dickens of a Christmas is a Roanoke holiday mainstay that stretches across three Fridays in December. Now in its 35th year, Dickens will kick off with the Roanoke Christmas Tree Lighting on December 1. Families will especially enjoy the activities the following Friday, however, as a Winter Carnival is coming to town! On December 15, a pet costume contest and the Coca-Cola Snow Zone are key attractions. Throughout it all are those Dickens-esque traditions, like roasted chestnuts, carriage rides, and gleeful street performers. If you love a parade, ‘tis the season! Communities across Virginia’s Blue Ridge are ushering in Christmas with floats, jingle bells, and Santa Claus bringing up the rear. Song and dance bring the season to life, and Virginia’s Blue Ridge is a creative destination to witness some of the best holiday performances Virginia has to offer. For example, the Roanoke Symphony Orchestra presents Holiday Pops! each year to sell-out crowds while Southwest Virginia Ballet dances The Nutcracker to the same. While the aforementioned events are best suited for adults, Roanoke Children’s Theatre is geared toward for families with young ladies and gentlemen. If this is you, be sure to catch The Best Christmas Pageant Ever: The Musical. It will be offered December 20-23 at the Roanoke Children’s Theatre at 541 Luck Avenue. Shopping may or may not be your favorite pastime. If it’s not, perhaps we can change that. In fact, once you window shop the independently-owned stores of downtown Roanoke, we’re confident you’ll want to actually shop them. Expect to find everything from apparel and jewelry to outdoor gear and gifts to please a palate. The magic of Christmas is most often found in the eyes of a child. Their wonder and delight is infectious! Claim the same when you join them in festive ways to celebrate the holidays. 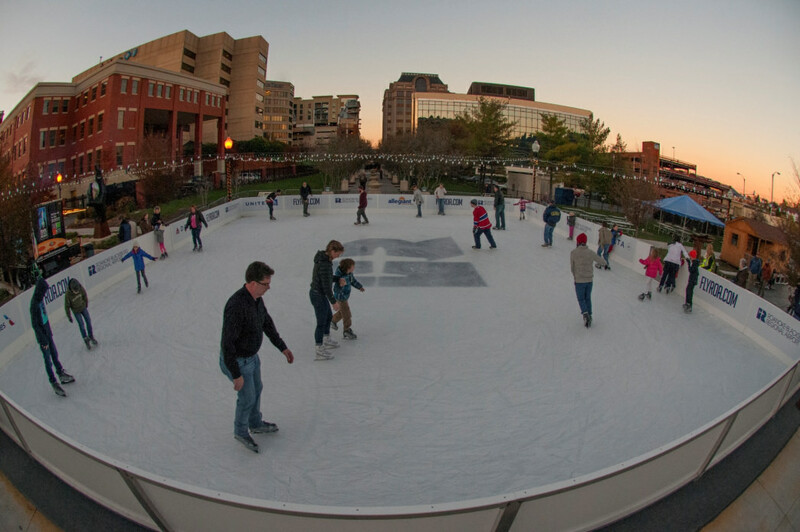 Some of our favorite options include the ice skating rink (Elmwood on Ice) and the Virginia Museum of Transportation where Santa is known to make an appearance by way of the Candy Cane Express. Make your holiday the happiest ever and share your experiences with us on social media. Just tag _ #BlueRidgeDay _ to add your photo(s) to an ever-growing showcase of area photos. Originally written by Visit Virginia’s Blue Ridge.